Behind the coils of razor wire, the walls of thick concrete and the columns of steel beams are men of all ages… minds searching for answers to "the game called life." Locked in the minds of most imprisoned men around the world are ambitions. Ambitions to be free and to escape the harsh reality they find themselves in. In America, a disproportionate amount of Black men languish in prison, yet they seek solace in the few legal activities available. Some lift weights; some play basketball; others write poetry… and yes, some play chess. What is it that is so attractive about the game of chess to inmates around the world, but specifically the U.S.? Perhaps it is the ability to control one's fate in a place where they are otherwise subjected to someone else's total control. Maybe it's a form of escape into a world of 64-square intrigue. Maybe it's the idea that some inmates are able to channel their aggressive energy in a more disciplined fashion. "As in prison chess clubs, where studies have shown that members have a significantly less degree of recidivism, it was evident here that chess had had a very constructive contribution to the personality of the individuals involved; such qualities as patience, foresight, objectivity, logic, planning, adaptability, intuition, caution, and seeing-things-from-the- other's-point-of-view [i.e., empathy] could be learned from chess, after all, and applied to the larger game of life." In February 2003, two students at Princeton University (rated 2000-2150 USCF) visited the New Jersey State Prison and played a 34-board simultaneous exhibition. After four hours of grueling play, the inmates made an impression as inmate Naifra Boyer drew blood amidst cheers and high-fives. On a visit two years earlier, FM Jude Acers stated that the competition at the facility was "fierce" and "above average." Acers dropped a game to inmate Charles "Tru" Merritt and was held to a draw by Boyer. There seems to be promise here. Jay Rutherford and Walter Oglesby face Princeton students. Photo by Annie McCormick, NY Times. If prison chess has such a positive impact, why does it appear so difficult to get cooperation from prison authorities to promote the game? In the latest New in Chess (2003, No. 3), there was a short piece written about a subscribing Utah inmate who was prohibited from receiving the magazine from authorities because he was said to be under "intensive management." The writer stated, "Who do they think he is? The Bobby Fischer of Utah prison who is preparing to escape with the help of encoded messages?" Chess seems to have developed an aura evoking fear in the uninitiated. The algebraic notation appearing to be some secret language adds to the perception of exclusivity. 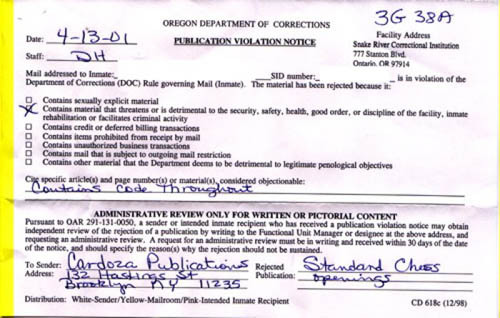 See the notice below rejecting chess materials sent to Prison in Oregon (USA). Steve Frymer of the Prison Committee of the United States Chess Federation has expressed difficulty in communicating with prison officials. Chess is indeed a virtual world of duality: cause and effect, defense and attack, right and wrong, reality and illusion. The most important duality is described by Boyer when he states that, "Chess is a game of life and death." Indeed. If these lessons can be learned at the chessboard, imagine what impact they could have in keeping young Black men from entering the prisons, or re-entering them once they have left. Understanding these principles can mean a matter of life or death in the game called life. Anyone with knowledge of Prison Chess Clubs, please forward this information to webmaster@thechessdrum.net. Thank you.